One of the most happening couples Priyanka Chopra and Nick Jonas have indeed become global icons of a perfect couple. The duo tied knots last year in the month of December and since then they have not stopped giving us couple goals. While Nickyanka is having the time of their life, fans love to see their astonishing photos together. Often called the power couple, Priyanka Chopra and Nick Jonas are climbing big stairs of success on professional grounds and flying high on their love life. These days they are having a gala time in Los Angeles celebrating the big Grammy nights. 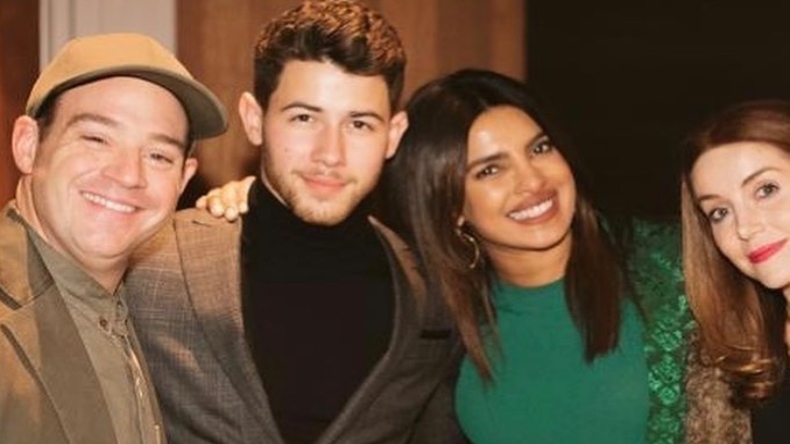 The recent Instagram posts of Priyanka Chopra and Nick Jonas reflect that they had a super bash with their friends who are nominated for Grammys. The couple danced and had fun with their celebrity friends, looking absolutely stunning. Priyanka Chopra took to her official Instagram account to share a few photos from the grand party where everybody can be seen having a great time. She captioned the photos expressing the happiness she feels celebrating her friend’s nominations. Concluding the post, she wished everyone a bit of good luck. In these photos, style queen Priyanka Chopra can be seen donning a beautiful green sweater with a blue skirt and a blazer while hubby Nick Jonas is wearing a grey pantsuit with a black shirt within. Priyanka can be spotted dancing fearlessly at the party and posing with her friends. Well, the couple were also recently captured at the Grammy weekend posing with her husband Nick Jonas and Shawn Mendes. The picture took the internet by a storm as the desi girl looked too hot to handle in a white bodycon dress.